Crochet a patchwork-style blanket using any of these crochet patterns. Most of the patterns on this page are free; included also is a link to a pattern book that for a relatively modest price offers even more designs inspired by quilts and quilt blocks. 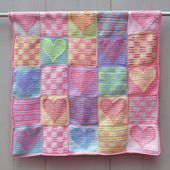 This patchwork-style baby blanket is crocheted using colorful acrylic baby yarns. Each square is crocheted separately, and then the squares are joined together using whip stitch, and a simple edging is crocheted around the outer edge. This pattern design is by Amy Solovay. This pattern is crocheted using the tapestry crochet technique. If you are not already familiar with this technique, you can check out a free tapestry crochet tutorial. See a larger picture of the blanket. Get the free chart with striped heart design. Get the free chart with striped checkerboard design. Both of these charts can be used to create other crocheted quilts, or for that matter, many other interesting projects. You'll create this Christmas-themed quilt-style blanket using several techniques: tapestry crochet, surface crochet, and cross stitch on crochet. This pattern design is also by Amy Solovay. Free Christmas Tree Afghan Square Pattern: This page includes a photo of the finished afghan square, plus a written pattern and instructions for crocheting it. Christmas Tree Chart #1: If you would prefer to work from a chart, you'll find one on this page. Chart #1 looks a bit odd at first glance; it looks more like a triangle shape than a Christmas tree. But that's because you'll first crochet a triangle shape using tapestry crochet, and then you cross stitch the background on top of it, which creates the look of a Christmas tree. Christmas Tree Chart #2: This is the cross stitch chart. Checkerboard Chart #1 -- gold, green and red version; see a photo of the finished square here. Checkerboard Chart #2: -- gold, red and green version; it's similar to square #1, except that the green and red color positions are exchanged. In my afghan design, I've alternated the two different colorways by row. A photo of the finished square is available by clicking here. The Christmas afghan linked above was created using designs from this series; as you can see from comparing the two photos, you can change the look of the squares dramatically by re-coloring them. I crocheted the original set of squares in blue, green and tan; the newer squares were crocheted in gold, red and green. These squares are all designed to be the same size (assuming you crochet them using the same yarn, and you don't accidentally use two different hooks to crochet them.) They can be used together to create quilt-style afghans in just about any size you like, from lapghans and baby afghans on up. This link takes you to an image gallery featuring an assortment of patterns, charts and diagrams for baby blankets and squares. These baby quilts all feature simple, but interesting checkerboard patterns worked in tapestry crochet. One design in the series is pictured at left, but there are a couple different options available. The sample use uses blue and white baby yarns to make quilt squares especially appropriate for baby boys. You could choose more feminine colors if the recipient is expecting a baby girl; and if you are not sure of the baby's gender, use neutral or green yarns, which could work for either. These designs need not be limited to use in baby afghans; so feel free to apply your creativity and use them in other ways. DIY Afghans is a crochet pattern book published by Leisure Arts. The designs presented in this book were all inspired by quilts and quilt blocks. A CD-rom comes with the book, and the CD allows readers to design their own quilt-inspired afghans using the blocks, edgings and crochet stitches stitches featured in the book. If this sounds interesting, and you'd like more information, check out this detailed book review of You can also click the "compare prices" button to check availability and lowest pricing at a variety of different Internet retailers. C.L. Halvorson designed the following crochet quilt patterns, all of which are available as free downloads at Ravelry. Scrap quilt throw pattern by Katherine Eng, posted at the Red Heart website; this pattern calls for Red Heart Super Saver. Crochet folk quilt throw by Katherine Eng, posted at the Red Heart website; this design reminds me of a log-cabin style design, but instead of many repeats the design only has one that radiates out from the center.